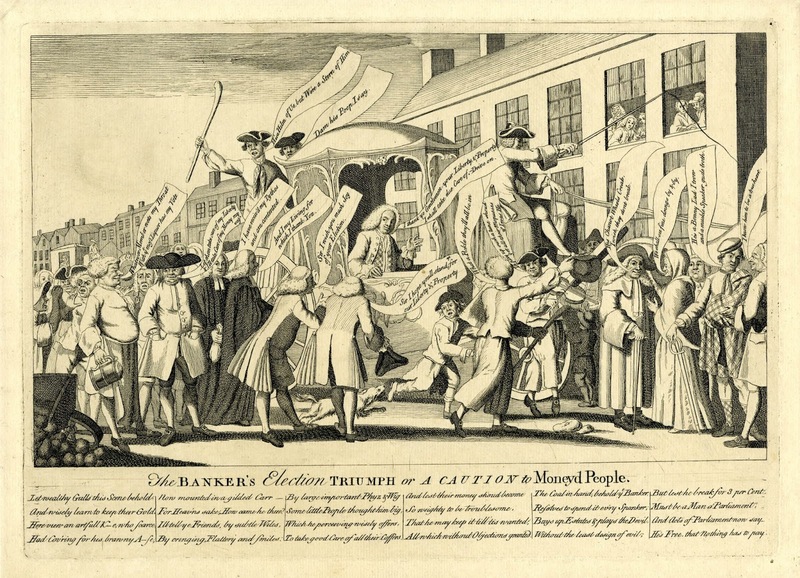 The Banker's Election Triumph or a Caution to Moneyed People, Jeffereys Harnett O'Neill, 1761, British Museum. 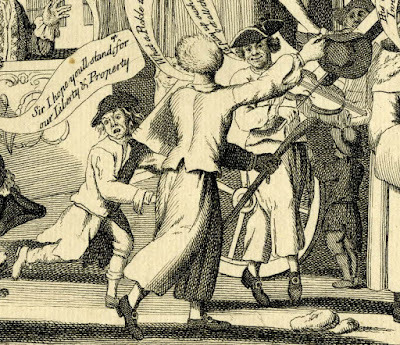 William Belchier, banker in Lombard Street and MP for Southwark wearing a tartan waistcoat, is driven in a coach, its door emblazoned with his monogram and two sailors standing up behind, along a street, presumably in his constituency. 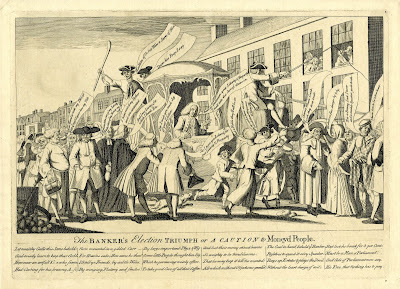 The crowd reacts in different ways: an old woman raises her fists in anger that her apple cart has been overturned; a publican holding a large tankard who will support any candidate who pays for liquor; a Quaker is determined to hold on to his money; two clergymen thank Belchier for their livings and tythes; two voters trusting Belchier to protect their Liberty and Property (to which he responds curtly); two sailors, one holding a cudgel making fun of the crowd, the other dancing as he plays the fiddle saying that if he were the candidate he would "play up siuch a tune should get all their Mopusses" (i.e. money); an old couple predicting trouble; a Scot admires Belchier and a smiling old gentleman agrees; in the centre a dog chases a street urchin. Running beside the carriage with his stick is a sailor. His back is to us, so we can clearly make out the single vent in his jacket, as well as the slit cuffs. His trousers or slops (or perhaps a garment that rests somewhere between those two definitions) are long and end at the bottom of his calf. 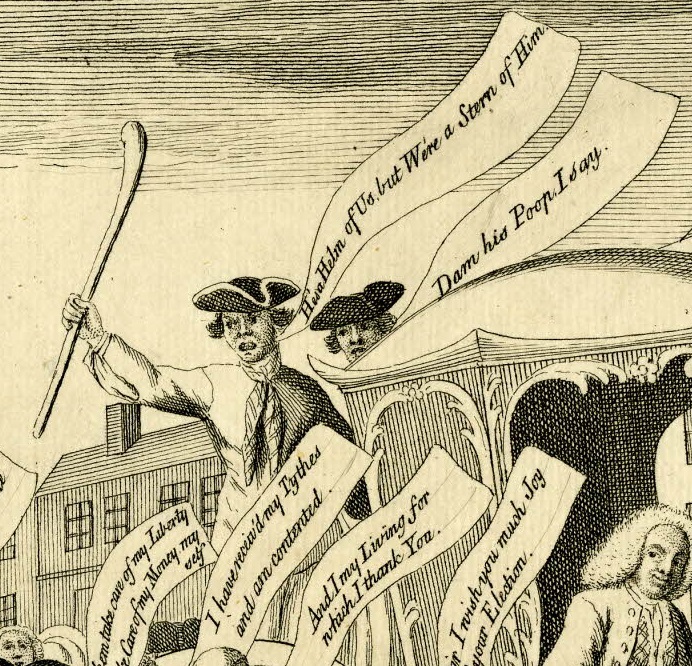 Our tar's hair is blowing in the breeze, and he holds a round hat with wide brim in his outstretched right arm. The lad beside him is probably not a sailor. Interestingly, he looks to be wearing a jacket over a coat. I previously misidentified the skirts of the coat as a pair of slops/petticoat trousers. Behind them is a sailor on his toes, playing the fiddle. Like his mate he wears a short jacket with slit cuffs that ends at the waist, and a pair of slops or trousers. This tarpawlin wears a backward turned cocked hat with tape around the brim. His shoes have pointed toes and oval shaped buckles. A pair of jacks hang on the back of Belchier's coach. The figure to the left wears a short jacket with open slit cuffs, a backward cocked hat with tape, a striped neckcloth, and angrily bears a stick. He calls out "He's a Helm of Us, but We're a Stern of Him!" The nautical speak is part of the "Caution" the artist gives: while Belchier might be steering, he's also subject to the repercussions that come from failure, specifically those meted out by the people. We only see the head of the angry sailor's mate, which is topped with a plain cocked hat, likewise turned backward. This tar calls out "Dam his Poop, I say."